This fast, overstable driver is engineered for all those big arm pros out there. 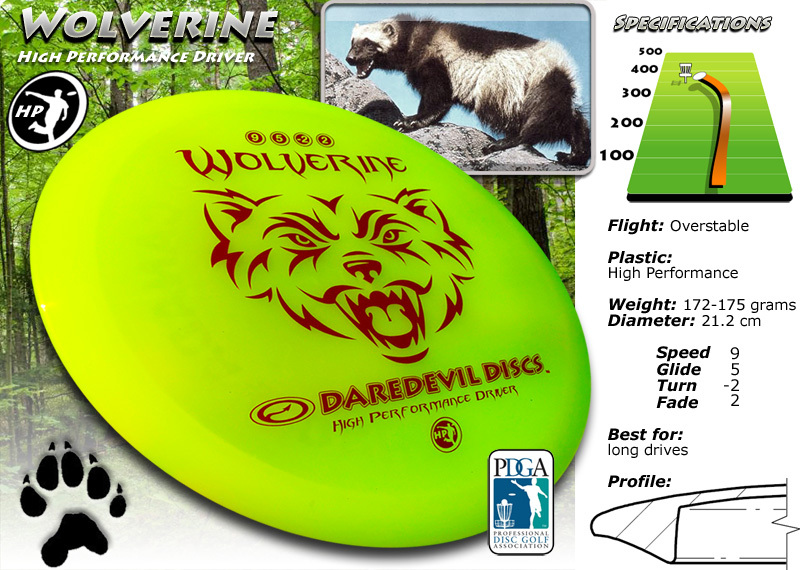 Its predictable flight pattern and super slick durable plastic will allow your throws to reach maximum distance. The wolverine has been described as the fiercest creature on earth and a fearless aggressive fighter that will drive bears away from their kills. Very powerful, muscular and territorial animals the Wolverine resembles a small bear and is the largest land dweller in the weasel family. Found in wilderness areas, forests and mountains of Northern Canada, it prefers to be far away from people. Roughly the size of a medium dog it has a very unpleasant odor and is also referred to as a “skunk-bear”. Wolverines primarily eat already dead animals however they do hunt and kill deer, mountain goats and other large mammals. They can tear off meat from prey that has been frozen solid and can also crush bones, which enables the wolverine to extract marrow. During winter months it uses it’s large feet as snowshoes, allowing it to walk on top of the snow.